The Boston Celtics fell to 1-2 on their west coast road trip after a tough loss to the Golden State Warriors, 109-105. Steph Curry finished with 49 points. Kyrie Irving notched 37 in the game. The Celtics dominated in the first half, especially in the opening frame, racking up 37 points in the quarter. Kyrie Irving and Jaylen Brown literally couldn't miss through the first 12 minutes of regulation, cruising the C's to an early 10-point lead. That offense disappeared in the second half, though, as Golden State made crucial adjustments that helped them take their first lead of the ball game. Turnovers plagued the C's in the third, as they squandered opportunities on the offensive end, leading to easy buckets for the Dubs. Steph Curry also caught fire in the second half, pouring in shots from every spot on the floor. That guided the Warriors to a double-digit-lead with two minutes left in the third quarter after a deep triple from the two-time MVP. Boston fought and clawed in the final seconds of the third quarter, though, to make it a 7-point-game heading into the final 12 minutes. That gave the kids a chance to pull the Celtics back into the contest in the final frame and Jaylen and Jayson Tatum stepped up to try and do just that. Tatum, who only had one field goal at the start of the fourth, confidently started to drive the lane to generate some offense for the C's, and suddenly when Kyrie and Horford retuned to the floor, it was a 4-point-game. The momentum was on the Celtics' side and finally with 4:30 left Irving retook the lead for the green with a crafty left-handed layup. Fouls sent Durant to the line on the next two defensive possessions, though, and it was a tie game at 95 with about 2:40 to go. Enter Steph Curry. Number 30, who had seemed quiet for the fourth quarter, reminded the Celtics he was in the building with a huge, deep three-ball, and then the next possession, wove through the defense to find the bottom of the net on a finger roll to make it a 5-point game with about 60 seconds left. 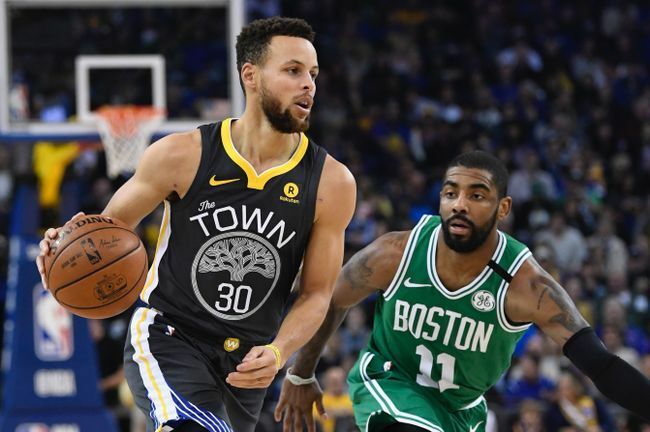 The Celtics couldn't overcome that deficit, and fell to the Warriors, 109-105 after free throws in the closing seconds and Boston dropped their fifth game in six tries. Follow Topher Lane on Twitter, @Topher_L. Photo credit: Kyle Terada/USA TODAY Sports.